Welcome to the life and art of Sr. Lucia Wiley, a muralist and painter who often worked in fresco. This site was first put on the Web in December, 1997, and since then many new people have been touched by Sr. Lucia's art. She was especially excited about having this opportunity to share her work and spiritual feelings with anyone who stopped by. The guestbook was periodically printed out and given to her. And she marveled at all the wonderful comments and email she received. Our tour begins with a chronology of her work and achievements. Then you should have a look at her mural the Building of the Morning Star and the Catalog of images from throughout her career, including art she made after she joined the Community of the Holy Spirit, an Episcopal order in New York City. 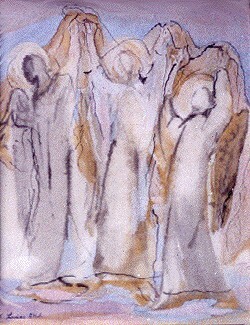 We also have a separate website that includes a presentation of Sr. Lucia's fresco technique, along with some biographical material in her own words. This project has been funded by the Thanks Be to Grandmother Winifred Foundation. We hope you enjoy this celebration of the life and art of this beloved spirit.